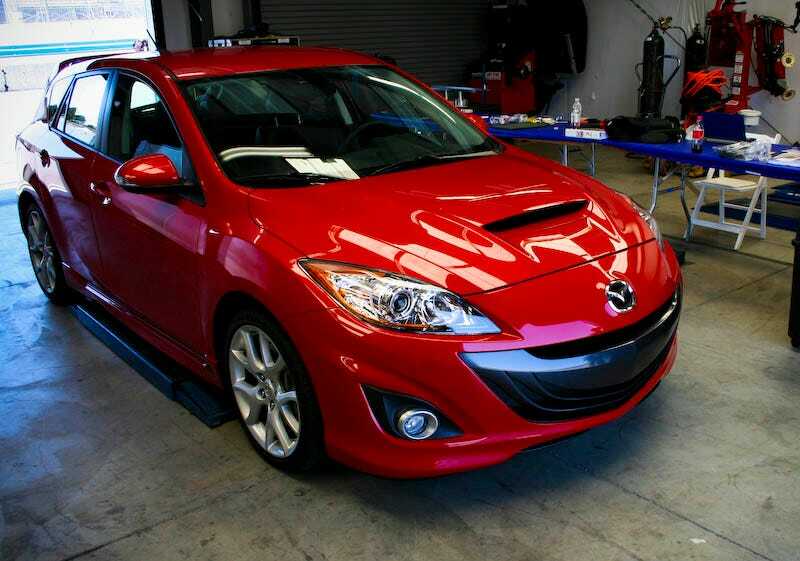 Like virtually ever other global performance car, the 2010 Mazdaspeed3 has been retuned for the American market. Unlike the competition, our version's actually better. Really. Full Disclosure: Mazda wanted us to drive the Mazdaspeed3 so badly they flew me out to Monterey and put me up in a swanky hotel. They also fed me Lobster martinis, which are neither as satisfying as regular lobster nor as intoxicating as a regular martini. Because Europeans are more likely to spend a lot of time close to the Speed3's 155 mph electronically limited top speed and tend to treat the sporty Mazda as a practical family car, it needs more stability than the US-spec vehicle. Enthusiast drivers here are more likely to exploit the performance on twisty mountain roads and are willing to make some compromises to do so, which means the Mazda USA engineers have been able to swap some stability for quicker handling. That difference points to the Mazda's unique position within the American market, where it's really the only serious FWD hot hatch and is cross shopped more with cars like the Subaru WRX and Mitsubishi Ralliart. Europeans, spoiled with choices like the not-softened-for-America GTI, truly wonderful French cars like the Renault Clio Cup and the hotter-than-hell Ford Focus RS tend to treat the Mazda as a bit of an also-ran. That second-rate status was created not by the 2.3-liter turbocharged engine — which remains largely unchanged for 2010 with 263 HP and 280 Lb-Ft of torque — but by the chassis, which exhibited a strong predilection for understeer and wasn't terribly agile by fast hatch standards. The boring styling also played a roll, but it at least gave the Mazda a certain sleeper appeal. The new car adapts the regular Mazda3's happy new design, but makes that grin louder with a deeper front splitter, a huge hood scoop, a big wing and 18-inch wheels of the same design as those on the RX-8 R3. Driving the 2010 model on the roads around Laguna Seca, we really missed the old under-the-radar styling. Other journalists driving these roads the day before had seriously pissed off the local law enforcement by hitting three-figure speeds in residential neighborhoods and catching air in Mazda5s in a school zone. In response, the CHP swarmed the area with speed traps. Thankfully, Mazda still makes cars in grey, so we grabbed one of those and slowly made our way to roads far, far away. The new 3's chassis is now purportedly much stronger (although Mazda hesitates to put a percentage on that) allowing the fitment of stiffer springs and firmer dampers. Those changes actually appear to improve the ride by better controlling impacts and minimizing their invasiveness on the chassis, but that hasn't come at the expense of feel. Like other vehicles in the Mazda range, power steering is boosted by an electric motor, but unlike vehicles like the 2009 BMW Z4 this appears to increase rather than reduce steering feel. Geometry remains the same as the old model, just with upgraded componentry throughout. Finally on some roads free of prying eyes and radar traps the new Speed3 responds to aggressive driving in a similar manner to the old one, albeit with more feel, more agility and, as a result, more speed. The engineers deliberately left in some torque steer rather than going overboard with power retardation in the early gears, but, while its still very noticeable, that sideways yank on the steering wheel now feels more like character and less like a dynamic limitation. Throw the car into a tight corner hard and it'll understeer, but a small lift works wonders to correct that. Even over heavily rutted tarmac it now puts its power down very effectively with a minimum of wheel spin. Mazda has actually made gears 2 through 5 slightly taller which better suits the character of the torquey engine. Peak torque hits at 3,300 RPM while peak power is at 5,500. After that, the next 1,000 RPM is basically overrun. Thanks to the new gearing you can leave the car in third for most roads and sit happily in the broad power band. A peaky four-cylinder this is not. Back at Laguna and what is now a pretty exciting road car is transformed into a competent if somewhat less exciting track car. The understeer that's still evident on less-than-perfect roads disappears on the smooth surface of Mazda Raceway, replaced with quick turn ins and good mid corner speeds. The faster uphill curves leave us wanting for a bit more power while the tight 2nd gear corner onto the main straight leaves the Speed3 struggling to put its torque down. Still, it's unflustered by the whole experience which leaves us to do some much needed concentrating on our lines. I think I finally have the right one through Rainey. All the upgrades make the new model slightly more expensive than the old one at $23,195 before destination and delivery, but the thoroughness of the changes more than compensates for the thousand extra bucks or so. The 2010 Mazdaspeed3 is faster, more agile and more fun to drive than before. It's still not the best hot hatch in the world, but it is the best hot hatch Americans can buy.